No campaign has used the Web as effectively as Barack Obama’s has, as his record-setting fundraising totals testify. He’s the second-most popular person on Facebook, after Olympic swimmer Michael Phelps. I have invited any SMUGgle with first-hand experience of the Obama on-line campaign (and who got the early-morning text message last Saturday about the Biden selection as the VP candidate) to become an Associate Professor and write a post analyzing its strengths (and whatever weaknesses they may see.) A couple of people have expressed interest, although neither has yet submitted a post. Hopefully we’ll have something fairly soon. 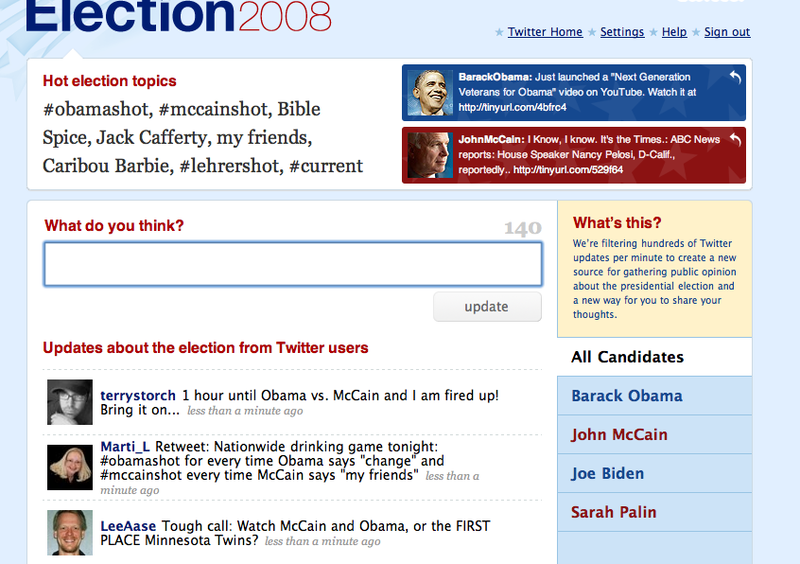 Meanwhile, because my political leanings are conservative and because I worked in campaigns and government on the Republican side for 14 years prior to a career change, I’m doing this post examining the McCain campaign and its use of the Web. As of this writing, Sen. McCain trails Sen. Obama by 1,236,581 “supporters” on Facebook, although I think there has been something of an uptick in support for McCain since he named Gov. Sarah Palin as his running mate. The GOP candidate recently launched a redesigned McCainSpace, which Erick at TechCrunch reviewed with a jab at the candidate’s superannuation. He also expressed bewilderment at why both McCain and Obama feel it is necessary to create their own social networks given that large social networks like Facebook and MySpace already exist. While I generally agree with Erick’s perspective for most businesses and organizations, in this case he’s flat wrong. The campaigns of the two major party candidates for President are by definition “big enough” to create a critical mass of interest that can make a standalone social network successful. Like the Republican “all of the above” energy policy that supports increased drilling, conservation and development of renewable alternatives, the social networking strategy for national campaigns should involve both the general purpose sites like Facebook and a proprietary site. In this way, campaigns own the data and can avoid being in a position where a decision by Mark Zuckerberg or his MySpace counterpart would limit their ability to communicate with supporters. And when you create your own site, you have the freedom to add functionality not available in the general purpose sites. It’s not “either/or;” it’s “both/and.” I’m a McCain supporter on Facebook, but I haven’t joined McCainSpace. Other people may not want to join Facebook, but are motivated enough by the presidential campaign to want to get involved somehow. If they go to JohnMcCain.com, they may just decide to join his social network as their introduction to social networking. Although the McCain campaign has been behind in its adoption of Web 2.0 strategies, it’s doing fairly well in more traditional Internet campaigning. For example, when I searched for Joe Biden this evening on Google, here was the result page (click to enlarge). The McCain campaign has others of its ads (including this one that is 94 seconds long and couldn’t be used on broadcast TV) on its YouTube channel. On the JohnMcCain.com site, as of this evening I saw this banner at the top of the page, which apparently offers different views of the site based on the user’s indication of voting intent (click the image to enlarge). His site also has a McCain Nation section to encourage activism, a blog that publishes photos and campaign news (and also has embedded YouTube videos, and also has a Volunteer Action Center. So, while the McCain campaign hasn’t attracted as big a following in the social networking sites, and hasn’t raised anything near the astronomical amounts Obama’s has through the Web and otherwise, it does appear to be closing the gap somewhat and doing some basic things right. The polls seem to indicate that this race will be another extremely close one. It’s guaranteed to be historic, with either the first African-American president or the first woman VP. I renew my call for someone on the other side of the aisle to provide a Social Media 302 course on the Obama campaign’s use of the Web. Update: Scott Meis, on his Social Media Snippets blog, has provided a helpful overview of the Obama campaign’s web efforts. Thanks, Scott! Obama’s decision leaked to the media several hours before his aides planned to send a text message announcing the running mate, negating a promise that people who turned over their phone numbers would be the first to know who Obama had chosen. The campaign scrambled to send the text message after the leak, sending phones buzzing at the inconvenient time of just after 3 a.m. on the East coast. I guess if you’re a strong enough supporter to give your cell phone number to a political campaign, you’ll probably forgive both the broken promise and the 2 a.m. CDT message disrupting your sleep. I hardly ever get into politics on this blog, but I was a political science major and worked for 14 years in politics and government. It’s hard for me to fathom that an announcement like this — the most important one of the campaign — would be leaked accidentally to the media after the campaign had made such a big deal about texting the choice to supporters first. Disclosure: My political background is on the other side of the aisle, and I’ll be voting for the “Wrinkly, White-Haired Guy.” And I’m thinking our Minnesota Governor, Tim Pawlenty, will be his running mate. I have been interested, though, in how Sen. Obama’s campaign has used social media, but I haven’t wanted to give my e-mail address or cell phone number to the campaign to experience it directly. You can’t even get into his Web site without providing your e-mail. So this is a call for someone to join the SMUG faculty as Associate Professor and do an analysis of the Obama campaign’s use of social media. I’m sure that among our 150+ SMUGgles we have several who received that early-morning SMS. If you’ve experienced the on-line Obama campaign first-hand and would like to write a post about what strategies and tactics you think have been most effective, you can become an Associate Professor in the SMUG Department of Political Science. If anyone else wants to write a post about Sen. McCain and the RNC’s use of social media, or any of the other campaigns’ activities (such as Ralph Nader’s or Cynthia McKinney’s), those would be welcome, too. Ground Rules: This will not be a discussion of the merits of candidates or their policy positions. There is no lack of sites where those debates are already taking place, both on the right and the left. The SMUG discussion will about how the campaigns and their supporters are using social media tools. Apply for a Associate Professor position via e-mail at the address listed in the “Contact the Chancellor” sidebar item. If you just want to share your brief impressions of the campaigns’ use of social media, you can put those in the comments below. Same ground rules apply.